Product categories of Air Jet Weaving Machine, we are specialized manufacturers from China, Air Jet Weaving Machine, Weaving Loom Machine suppliers/factory, wholesale high-quality products of High Speed Air Jet Weaving Machine R & D and manufacturing, we have the perfect after-sales service and technical support. Look forward to your cooperation! 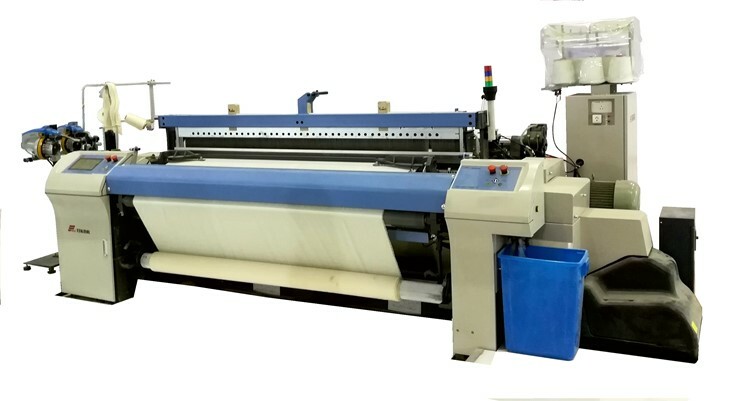 High speed performance is one of the most important peculiarities of RFJA30 air jet weaving machines, more suitable design on warp yarn path position and beating dynamic balance system highly reduced the vibration and noise, it helps to realize higher speed working. The high level designed weft insertion system; shedding system and brand new designed frame structure ensure the Loom is always stable when working at high speed. The simple operation concept is reflected on every details of RFJA30, everybody can operate easily. 1) New designed frame structure and Flexibility for high speed. 2) New designed beating dynamic balance system. 4) Optimum designed link beating motion. 5) Bath oil lubrication is used inner transmission gearbox. center lubrication is used to the other parts of the loom.